Barts Pathology Museum is one of those mysterious London places that I've always wanted to visit. I love the Hunterian Museum on Lincoln's Inn Fields - I can't imagine myself ever getting sick of peering at strange things floating in preservative. There's always a tension in these museums between education and entertainment, you can simultaneously learn a great deal about human anatomy and also gawp in open-mouthed freakshow horror at deformed skeletons. Unfortunately there's no photos of specimens in this blog post (due to the pesky Human Tissue Act 2004), just art, but if you want a taste of what's on display visit the excellent Museum blog. As I strode up the nondescript concrete stairs to the Museum, jammed in a hard-to-find corner of St Barts Hospital, I was filled with anticipation. I passed a rather incongruous Roman stone coffin, and after a few more flights of stairs entered the room. Wow. If Victorian anatomical specimens floating serenely in jars of formaldehyde are your thing, this is heaven. Thinking of this as heaven seems rather appropriate actually: the people who these specimens have been harvested from are experiencing a kind of immortal afterlife, albeit not quite in the way they might have imagined. The reason the Museum is open to the public is an art exhibition by Geoffrey Harrison called 'Me. Complete. You'. 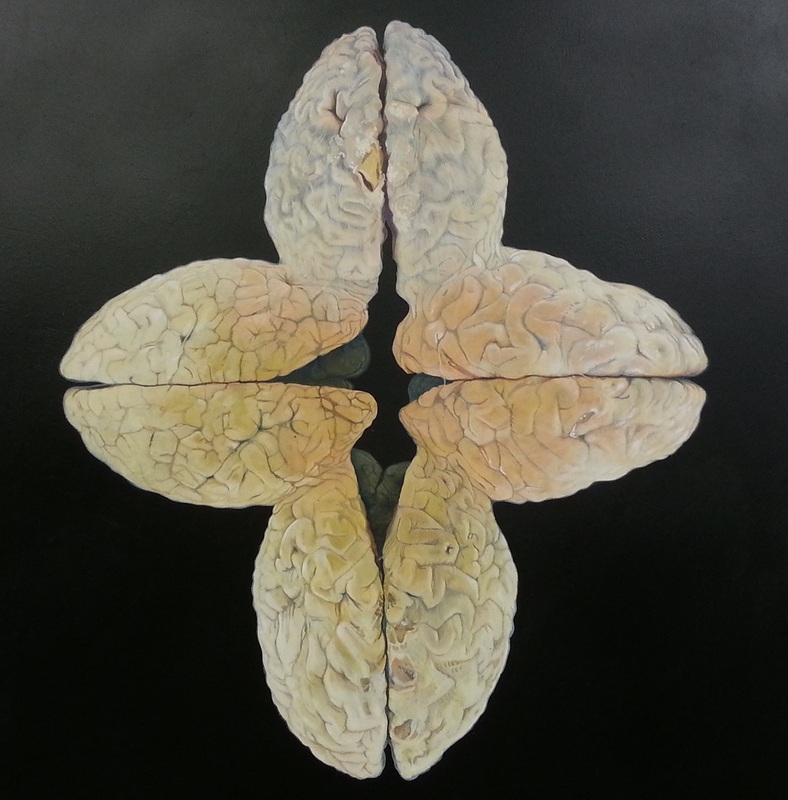 The work is a series of paintings examining kaleidoscopic reimaginings of dismembered anatomy. We see wreaths made of human hands, ruddy lumps of mangled meat constructed from swollen gouty fingers, four brains mashed into one symmetrical shape or rotting, slightly perverse chunks of unidentifiable meat. All sounds pretty disgusting right? It's not. There's a medical precision, an impossibly fine level of detail that frequently borders on the photographic. This imparts a strange beauty even though we're constantly aware that what we're looking at is monstrous and freakish. This is the same feeling you get looking at some of the specimens, meaning exhibiting this work in this space is about as perfect a fit as you could imagine. The tension I mentioned earlier between education and entertainment is particularly strong in this museum. On one hand there's a definite bias towards visitors with a medical background. The specimens on display aren't directly labelled, you have to refer to a number and look it up on a laminated piece of paper nearby. Even then the descriptions are often written in professional medical terms, with little consideration given to a layperson looking at them. If you've got a basic grasp of medical terms and anatomy you're just about able to keep your head above water. Harrison's faintly satirises this in the names of his work examples being; Heartraeh III; Brainiarb IV; and Maindala. But the underlying 'cabinet of curiosities' Victorian mindset is never far away. One specimen struck me as particularly bizarre. In the 1890s a patient in the psychiatric wing of St Barts slashed his throat open with a folding blade and died. They have the slashed throat in a jar, the ragged wound clearly visible right across it. Standing next to it (also in a jar) is the folding blade itself; knife and wound married to each other in perpetuity. It's questionable exactly how much medical knowledge you can learn from this specimen, my thoughts more along the lines of "woah that's gross but kind of cool in a sick way". I began to see Harrison's work as a response to my reaction to this slashed throat: an exhibition aimed precisely at the thin membrane between science and freakshow. We're invited to consider the historical, political and medical implications behind the specimens. Perhaps the best example of this is Skulluks II: four skulls combined into a four-eyed lumpy hunk of bone. Each of the skulls is numbered, and each, in tidy Victorian script, reads the racial origin of the skulls: "African", "Greek (Island of Scha), "Native Maltese" and "German". Just a few metres away from the painting are the skulls themselves. In isolation they're perfect examples of Victorian racial phrenology, a perverted form of Darwinism justifying the ill-treatment of 'lesser' races. The skulls of Africans would be described in bestial terms, directly compared to apes and monkeys. As labelled specimens displayed without commentary they serve as unexamined relics of bygone views. 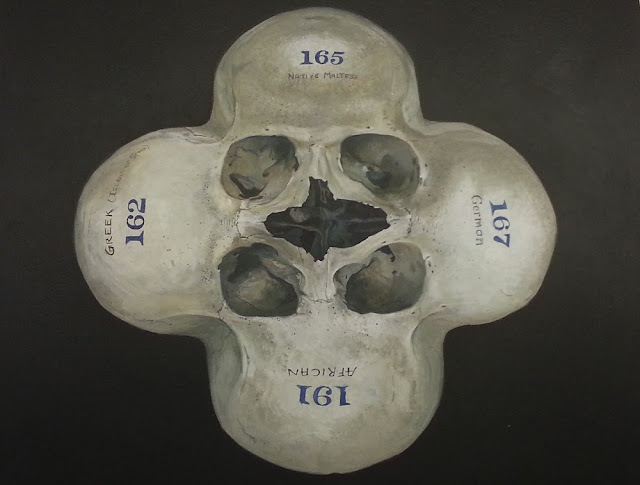 Harrison recontextualises them under a modern gaze, the way he combines the skulls emphasising their similarities rather than their differences. As you ponder the specimens its impossible not to get a heightened sense of your own anatomical architecture. I found myself flexing my fingers on looking at stripped down, diseased hands in jars - I quietly clacked my teeth together when I saw a boy's jaw crudely wired back together after he was sucked into a printing press. 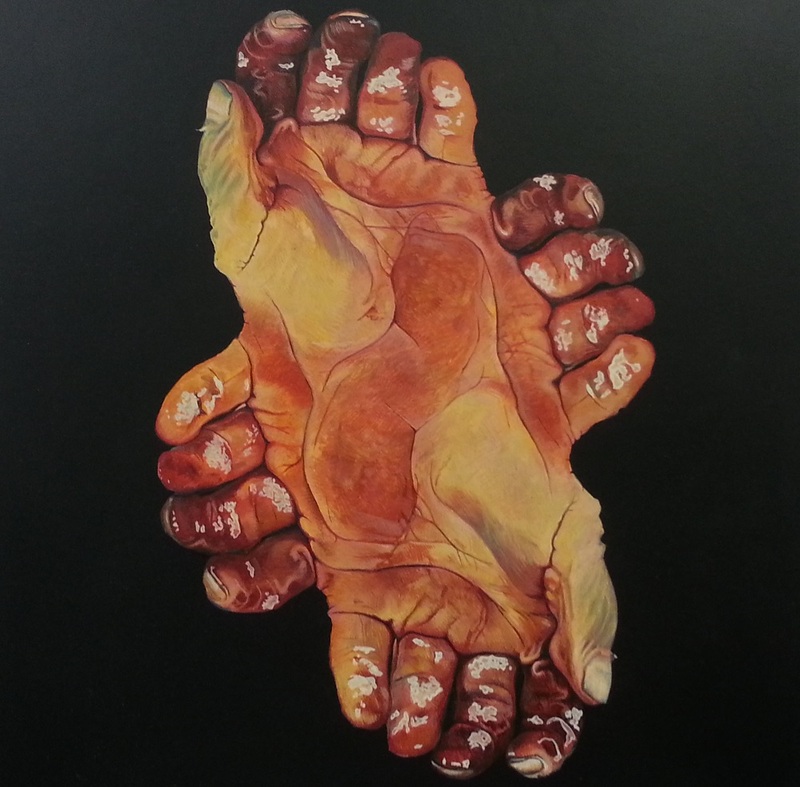 I found this instinctive connection we make between our own bodies and the specimens depicted through almost all of Harrison's work. The most literal example is Substantia Grisea - two brains connected by a long, ropey umbilical cord. This is an important wakeup call, a reminder that though we may believe ourselves to be enlightened, spiritual beings, as far as the universe is concerned we're fragile hunks of meat, cartilage and bone. One careless misstep, one random genetic abnormality or poor decision and that could be us in those jars, our warped and smashed skeleton gawped at by open-mouthed denizens of the year 2113. 'Me. Complete. You' is one of the best exhibitions I've seen in London this summer. 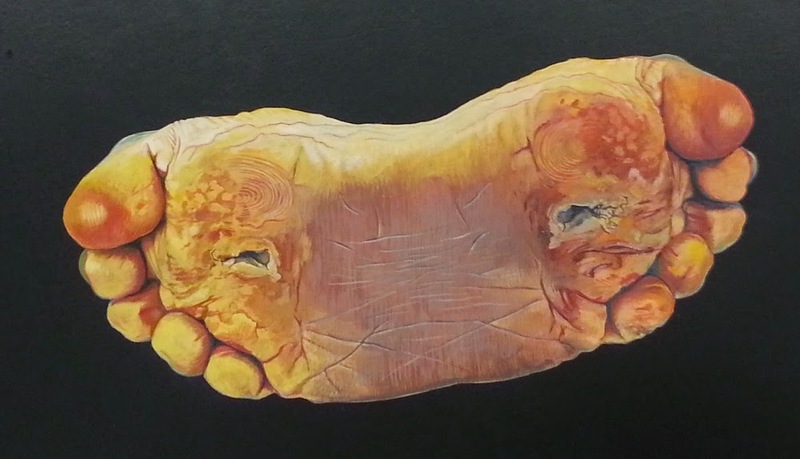 Barts Pathology Museum is absolutely fascinating in its own right, yet this exhibition provides the crucially important context to the body parts on display. I highly recommend everyone check it out, although perhaps if you're a bit squeamish about human anatomy it might not be for you. This is the best marriage of exhibition and location I could imagine and just about the ideal example of the crucial marriage between science and art. 'Me. Complete. You.' is open from 2pm-6pm Monday to Friday August 16-27th (excluding August 21st and 22nd). Free entry.